It’s completely understandable that not everyone wants a Ford F-150 Raptor for their off-road shenanigans. It’s a full-size truck and it’s not exactly cheap. 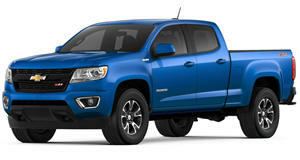 Fortunately, Chevrolet has a new mid-size truck solution: the Colorado ZR2. Powered by either a 2.8-liter diesel with 181 hp and 369 lb-ft of torque, or a 3.6-liter V6 with 308 hp and 275 lb-ft, buyers can also pick either an extended cab or crew cab, depending on their personal needs. This video produced by Chevrolet basically just shows the ZR2 doing its ridiculously awesome thing off-road. With its much wider track and lifted suspension, the ZR2 looks different from the standard Colorado, which is a good thing. ZR2 buyers certainly don’t want people mistaking their truck for a base model. With its front and rear electronic locking differentials and the first off-road application of Multimatic Dynamic Suspensions Spool Value damper technology, it’s clear Chevy didn’t hold back. Real engineering and financial investment was done here. Rock crawling. Desert running. A Baja-style race. No problem. The ZR2 is ready to play.